Will Reckless Driving Put Points on My Driving Record? If you’re charged with reckless driving in Virginia, you may be wondering about the possible demerit points on your driving record. Frankly, it’s confusing. And there’s lots of conflicting information in the internet. Let me clear up the subject for you. 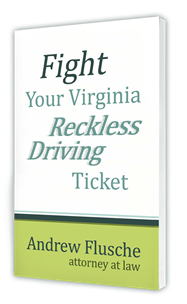 If you have a Virginia driver’s license, a conviction of reckless driving will put 6 demerit points on your record. The conviction will stay there for 11 years. That’s the exact same treatment as a DUI. Six points alone won’t kill your record. But if you have some other violations on there already, six points could tip you over the edge to be suspended by DMV. If your license is from another state, the situation gets more complicated. In short, points are controlled by your home state. Virgina has nothing to do with it. The states (except Georgia, Massachusetts, Michigan, Wisconsin, and Tennessee) are members of the national Driver’s License Compact. That means that they share conviction and suspension information with each other. 1. Will the conviction even go on your driving record? Not all states will record all convictions. 2. If the conviction is recorded, will you get points for it? States handle this differently. Some will match the conviction with the point table for in-state offenses, some assign a set number of points for any out-of-state offense, and some states won’t assess points at all. As you can see, that question is a bit involved. There are several factors to look at in answering it. Give me a call, and we can discuss your particular situation.